Luis Martinez ’19, a Harvey Mudd College physics major, received the Chambliss Astronomy Achievement Student Award for his exemplary undergraduate research presented during a poster session at the 233rd Meeting of the American Astronomical Society in Seattle. The January meeting was attended by a record number of participants, including 360 students in the competition: 214 undergraduates and 146 graduate students. Martinez was recognized for his research in astrophysics with Jorge Moreno, an assistant professor of physics and astronomy at Pomona College. Martinez’s research, “What Lights up a Galaxy Bridge,” focuses on simulating galaxy merges to gain a better understanding of star formation in galaxy bridges. 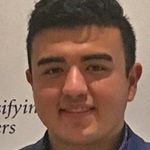 He started the research project last summer at the Harvard-Smithsonian Center for Astrophysics and received a SACNAS Student Presentation Award in November. He and Moreno are continuing their work through this academic year and anticipate publishing their research this year. Martinez plans to attend graduate school after Harvey Mudd. Posted in: Experiential Learning, Physics, Research, Students.